We do love a good Western here at OC Movie Reviews and we love the Cohen brothers, so given this anthology of six-stories from them, available now on Netflix, it’s a win-win. The Ballad Of Buster Scruggs sees Tim Blake Nelson (“Colossal“, “O Brother, Where Art Thou”) as a singing, sharp-shooting cowboy who goes by many names and has many, many often inventive ways of killing other cowboys. Most of which, whilst gruesome, are very funny in the black-comedy way we love from The Cohen’s. However, you can’t be the fastest, best shooter in the west forever, can you? Near Algodones is where James Franco (“The Disaster Artist“, “The Vault“) takes over as, quite possibly, one of the unluckiest men in the west. First, he tries to rob a bank in the middle of nowhere but teller, Stephen Root (“The Man In The High Castle (TV)”, “Spectral“), has other ideas. In fact, he’s as mad as a box of frogs and chases Franco away only for him to be subsequently caught by Ralph Ineson (“Ready Player One“, “Star Wars: The Last Jedi“) and sentenced to death. When that doesn’t go to plan, for Ineson, Franco is met by a friendly cowboy moving his heard, only for him to discover that he’s actually a thief and Franco ends up at the gallows once more. Meal Ticket stars Liam Neeson (“The Commuter“, “A Monster Calls“) and Harry Melling (better known as Dudley Dursley from Harry Potter). Neeson is an old, grizzly man making his way from town to town with Melling who has a one-man show. Melling, with no arms or legs, is perched on a chair and orates to the dwindling crowds on everything, the same spiel over and over again. Neeson begins to get tired of it and looks for a way out, his salvation coming in the form of a clever chicken, for Melling, not so much. Next, we have All Gold Canyon which features a near-unrecognisable Tom Waits as a prospector. We follow Waits as he descends into a lush, green valley, nature making way as he digs and digs and digs for gold, finally coming across a huge haul, only to then be shot in the back by Sam Dillon (“Boyhood”, “Live Cargo”). Is that the end for Waits and his gold prospects? The penultimate story is The Gal Who Got Rattled. Zoe Kazan (“The Big Sick”, “Ruby Sparks”) is on a wagon train with her brother Jefferson Mays (“Inherent Vice”, “The Giver”) when he suddenly dies. This leaves her with just a young-boy helping out with the wagon, but the boy suddenly wants a large payment for doing his job, a payment Kazan doesn’t have. Luckily for her Bill Heck (“The Amazing Spider-Man“, “The Alienist (TV)”) is one of two-men leading the wagon train and he takes a shine to Ms Kazan. All seems well, but Kazan strays from the wagon train and when Grainger Hines (“Lincoln”, “The Knick (TV)”), the second man leading the wagon train, finds her, she’s slap-bang in the middle of Indian territory. Finally, it’s Mortal Remains: Five people; Brendan Gleeson (“Paddington 2“, “Assassin’s Creed“), Tyne Daly (“Cagney & Lacey (TV)”, “Spider-Man Homecoming“), Saul Rubinek (“Warehouse 13 (TV)”, “Unforgiven”), Chelcie Ross (“Major League”, “Basic Instinct”) and Jonjo O’Neill (“Defiance”, “Constantine (TV)”) are passengers in a wagon headed to a small town. Each of them has a story to tell and each of them has his or her opinion about what makes people, people. Daly is a clean-living woman, a believer, to her there’s just upright people or those who’ve lost their way. Rubinek on the other hand is a gambler and he believes you can tell everything you need to know about someone by playing them at cards. Ross meanwhile is a trapper, a grizzly man who has a lot to say for he doesn’t speak to many people alone, in the woods all year. Finally, we have the enigmatic O’Neill and the smiling Gleeson. They allow the other three to tell their stories, reveal themselves, before one of them finally asks who they are, what they do. It transpires they are bounty hunters, and that body on the roof, is indeed someone they are claiming. Each of the stories is around 20 minutes in length. The opening, titular story is a delight, Tim Blake Nelson is in fine fettle and The Cohen’s have a lot of fun bringing a story to life that, if you know the song “You Don’t Mess Around With Jim” by Jim Croce, you’ll have a good idea of the story. Near Algodones feels one of the shorter stories but is filled with Cohen brothers’ humour and Franco is a delight, a perfect role for him. Meal Ticket is the slowest of the six segments, it’s the darkest too. Neeson barely says a word whereas Melling rambles and rambles as he performs on stage. It has to be said that Melling is an absolute wonder, he performs superbly and is easily one of the standouts of the segments, even when he’s not talking, his expressions are perfect. 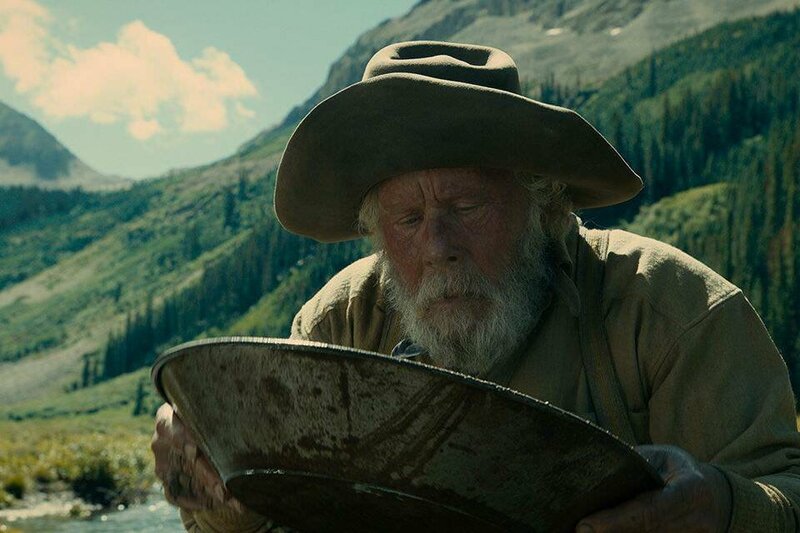 All Gold Canyon is beautifully shot, and Waits is brilliant as the grizzly old prospector, talking to the land. The Gal Who Got Rattled is another that feels a tad long in comparison and is the most poignant of the six. The Mortal Remains is very funny, sticking five, very different, people in a carriage, each of them telling their story, arguing, jostling, comparing opinions. So much is crammed into such a short time and O’Neill is a scary delight. So, there you have it: The Ballad Of Buster Scruggs sees six segments set in the old west linked by one thing, death. Where it takes people, what it leads to, the people and their lives leading up to it. The Cohen’s revel in the macabre and manage to make the gruesome, darkly comic. Brilliant.